How to I get to the start? St Jean Pied de Port is a small pilgrimage town at the foot of the French Pyrenees in Southern France. The best way to get there from France is by train from Bayonne-Biarritz. There are no direct trains that go there from Spain. Between May and October there are two buses per day from Pamplona to St Jean. * From International cities we recommend that you fly to Madrid and then onto Pamplona. Or you can get a train or bus from Madrid to Pamplona and the local bus to St Jean. * You can fly to Paris and onto Biarritz, or take a fast train from Paris to Biarritz-Bayonne. Iberia flies to Madrid and Paris from most countries with connecting flights to Pamplona or Biarritz. * From the US you could also fly to London, Paris or Dublin where you can get a cheap flight to Biarritz. * From Paris you can also get a TGV train to Biarritz and a local train to St Jean Pied de Port. * From the UK, you can take an EasyJet flight to Biarritz and a train to St Jean Pied de Port. * From South Africa, the cheapest flights to Madrid or Paris (under €800) are usually on Emirates , Turkish Airlines or Qatar: Iberia fly on certain days and although are more expensive [about R1800 more than Emirates] the flight duration is shorter, you arrive in Spain early in the morning which makes it easier to reach St Jean in one day, and the flights arrive back in South Africa earlier than other airlines. NB: Check the wait overs on the way to Europe - the cheaper flights can have wait-overs of up to 12 hours. Which Camino do we walk? In France and Spain we will walk the Camino Frances or the Camino Aragones. In Italy we will walk the Via Francigena. What if your walks are fully booked? We can put you on a waiting list but if you are anxious to put your name down for a walk with a tour company, we can recommend other companies that offer walks on the Camino. A quick Google search will result in many other sites and you'll be spoiled for choice. What do you mean by 'no-frills'? There are many different ways to do a pilgrimage. You can walk alone carrying your backpack, staying in the dedicated pilgrim shelters along the way. amaWalkers Camino offers a 'no frills' alternative to walking the Camino on your own, or with a 5 star guided tour. An experienced Camino Group leader accompanies each group to oversee all the practical stuff like your private accommodation, transport and baggage transfers. There are no back-up vehicles following behind you: no 5 star hotels with three gourmet meals a day to pay for; no Tour Guides leading the way to wine tastings or visits to museums. .
No. This is an accompanied pilgrimage walk to Santiago (not guided Tour on the Camino) with a Group Leader who will accompany you on the 16 and 18 day walks. The ​leader will look after the logistics like hotel accommodation, transport, reservations for meals in small villages where there aren't many options, and ensure that your luggage is transferred each day. Although our Group Leaders have extensive experience of the Camino pilgrimage itself (which they love to share) they are not European registered Tour Guides with expert knowledge on every monument, town, city or Region that you will visit on the 800 km Camino Frances. Guided tours of the monuments or historical areas are available in most towns - visit any Tourist Office for more information. Invariably, on a guided tour, the group has to stay together, eat together, and be at certain places at certain times to continue with their tour. Although some groups gel into a tight family, the only times the Group Leader will expect you to be together is on the days you get transport between cities. Our walks differ from 'guided tours' in that you are free to start walking when you want to each day. You don't have to stay with the group during the day (you can walk at your own pace) and you are not charged in advance for meals which you might not want. Usually the groups come together for the evening meal and chat about their day. If you want to take a bus or taxi on some stages you'll be free to do so. This is your Camino and we want you to experience it your way! Is this a religious tour? No, although these are essentially Catholic pilgrimage trails, the Camino and Via Francigena have become secular, spiritual journeys enjoyed by Christians, Buddhists, agnostics and secular humanists. One can enjoy it just for the wonderful hike through stunning landscapes, but we hope that it will be more than just a long trek! The majority of the important architectural monuments are churches, cathedrals and monasteries. Some offer the pilgrim a special blessings and others Gregorian Chants - all part of the rich tapestry of tradition that makes the Camino so special. Many people walk the Camino for deeply spiritual reasons and our walkers are sensitive to others in the group and people they meet on the trail. Most large villages and towns in Spain have regular services but some only on certain nights. Click here for a list of places that have mass. Do I have to train for the walk? Yes please! This is a hiking group with stages of between (20km to 25km) 12-15 miles per day. Although there is no technical hiking (no ropes, scrambling or serious climbing) some of the paths are on challenging terrain with some steep uphill and downhill sections, mostly graded EASY or MODERATE on hiking scales. You don’t have to be a super-fit hiker to walk the Camino but you should be fit enough to walk an average of 20 km (12.4 miles) per day for 16 days. The average time taken to walk each stage is approximate for the average walker - 3km to 4km (1.86 miles - 2.48 miles) per hour - but this will depend on the terrain and your level of fitness. If you find that you are unable to walk up to 20 km per day you must budget extra for bus and taxi transport. Many people who have not trained have found hiking the Camino physically challenging and you don't want to be so exhausted each day that you cant manage any sightseeing. ﻿There are a few roller-coaster sections, with many up and down hills. Start walking short distances at least three times a week, building up to longer distances﻿ five times a week for a few months before you leave. If you live in a part of the world that is 'hill-challenged' we suggest you devise a workout regime on flights of stairs at your local shopping mall, stadium or underground. If you have access to a gym, use the incline facility on a treadmill to simulate hill walking or use the StepMaster as well as the treadmill. Do we have to walk together? ﻿Not if you don't want to. You are free to walk at your own pace or with other group members. This means that fast walkers won't be held up by slow walkers and they in turn won't feel pressured to race-walk their Camino. It is important that each member of the group have enough 'space' to experience the spirituality of the landscape and this millennial old pilgrimage trail their way but also have the option of sharing the camaraderie with their group members. Must I carry a backpack? No, as we are staying in pre-booked hotels or inns you can have a small suitcase (up to 15kg) transported per stage ( +- 25 km) and only need to carry a light day pack. It is often more comfortable to wear a regular backpack with padded shoulder straps and waist belt, and send your luggage ahead in a small suitcase or duffle bag. Do I need a sleeping-bag? No, you won't need a sleeping bag. All places provide towels but we recommend that you bring a small hand towel and soap. The weather is unpredictable but May is usually cooler than September and has a slightly higher rainfall. June/July can be warm but not as hot as August. A suggested list of clothing will be included in the first newsletter sent to you once you have registered for the walk. If you intend sending your luggage ahead you can pack more than if you are going to carry your pack every day. What if I have extra luggage? You can have your luggage transferred from one place to the next, or you can send a suitcase or parcel to a Post Office (Correos) in Santiago, or the Camino storage center in Santiago. Bags are transported from hotel lobby to hotel lobby, mainly by retired people, many of them women. Some historic buildings do not have elevators so the 15kg (33 lb) limit per bag is important for both you and the people who transfer your bag each day. If you have more than 15 kg (33 lbs) extra luggage you will need to transfer more than one bag or send some stuff to Santiago for collection there. How How should I take my money? Cash is King on the Camino and in Italy. Very few places will accept Travellers' Checks. In small places you'll need to pay in cash. In larger towns and cities places will take credit cards or debit cards. Most bigger towns and cities have ATM's where you can withdraw money, usually a maximum of €300 per machine per day. If you need more, try a different bank machine. For a list of most places with ATM's, click HERE. We do not charge you up-front for meals. Although many hotels in Italy are B&B only a few places in Spain offer breakfast. In some pensions and apartments you can make a light breakfast or communal evening meal in the kitchen. Pilgrims usually have a breakfast stop after an hour or so of walking. Lunch can be a picnic on the side of the road or in a café-bar or restaurant, and dinner could be a communal affair with pilgrims chipping in or a special pilgrim menu in a restaurant or cafe-bar. There are Menu del Peregrinos (pilgrims menus) offered all along the route in Spain but not many in France or Italy. These usually consist of a three course meal for as little as €10 which includes wine, water and bread. How will I find my hotel if I arrive in the town first? Our amaWalkers Booklet has town and city maps with directions to your accommodation as well as a photograph of the place where you will be staying and information on ATMs and laundry facilities. The hotels have a rooming list and will place you in the correct room. Should I learn French, Spanish or Italian? Many older people in Europe do not speak English (or German, Dutch, Portuguese, etc). Knowing some French, Spanish or Italian will be a great help and will be much appreciated by the locals who meet pilgrims from all over the world. What if I get blisters or can’t walk? You have the option of taking a bus or hiring a taxi to transport you and your pack between stages. If you need more than one day's rest you can use transport every day until you are able to start walking again. What do we do after we have checked in? You can do your washing, have a siesta, sight-see or do some shopping. A list of interesting places to see is included in your map guide. What happens when we get to Santiago or Rome? It is great to walk into the last city as a group but if this is not possible we can all meet at a pre-arranged time for a photo-shoot. If we arrive before mid-day, we will visit the cathedral or St Peter's to perform the ancient traditions of hugging the saint, viewing his casket in the crypt below the altar and attending the beautiful pilgrims mass. In Santiago, if you are lucky you might see the Botafumeiro swing that day. We will go to the Pilgrims Office to collect the Compostela/Testimonium and then check into our accommodation. This is the last night that your group leader will be with you in her official capacity. Of course, you could take her out for a drink, if you like, to celebrate your wonderful achievement! Spain: The following day you will be free to wander around the city or you could take a bus or booked tour to Finisterre – The End of the World – a fitting end to your magical Camino - or you might continue with your holiday in Spain or Europe. The 'Credencial' is a pilgrim passport which you have stamped at each overnight stop or in café-bars, churches, tourist offices and so forth. When you get to Santiago or Rome you will need to present the stamped credencial at the pilgrims office in order to qualify for the ‘Compostela’. The Credencial also allows you to stay in pilgrim accommodation on the Camino. What is the 'Compostela' and 'Testimonium'? 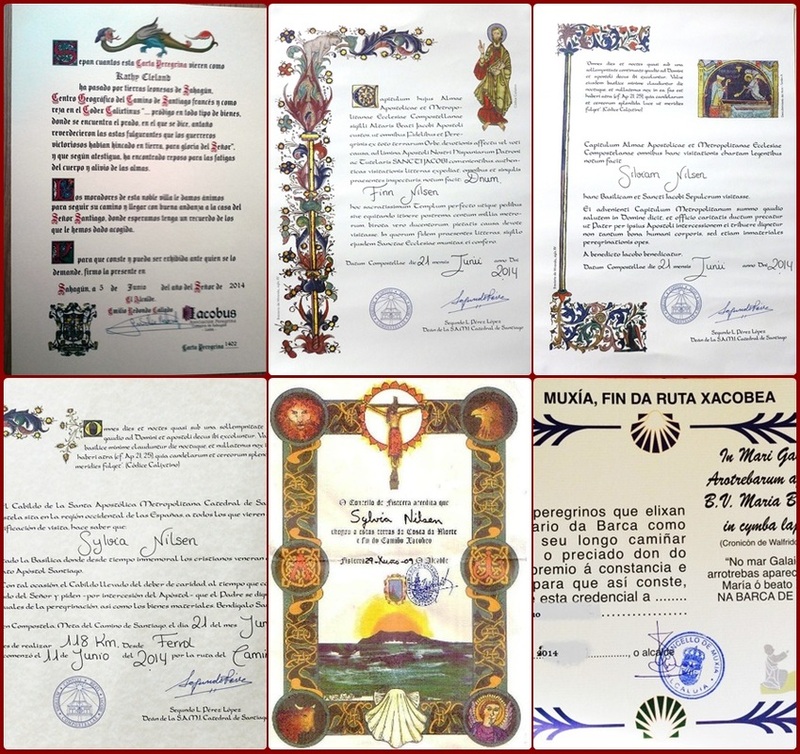 These are certificates of completion – based on medieval document in Latin – which are given to pilgrims who walk the last 100km (or cycle the last 200km) to Santiago/Rome and profess to having walked for a religious or spiritual reason. If you do not profess to either, you will be given a different certificate. You can also ask for a Group Certificate and a Distance Certificate. Your Group Leader will arrange for these certificates to be prepared for you. When you arrive in Santiago, you can either all go to the Pilgrim's Office to collect the certificates (there could be long queues!) or one or two of you could go to the office with her to collect all the certificates. 1. Selecting a walk that is appropriate to your interests and ability and being sufficiently trained to do the walk. 2. Preparing for the walk by reading ALL the information on our website, and the material we send to you about the walk. 3. Respecting other members in your group, especially the group leader, as well as the laws and customs of the Spanish people.